T8 Triumph Spares is run by Rob (many people know him as Storm). After various jobs in the motor trade, including stores and mechanics, the opportunity came to purchase the Triumph, Lucas and Amal stock from Reverts, Ipswich when they closed their doors for the last time in 2001. T8 Triumph Spares was born shortly after. With over 30 years experience in the motor trade, mostly on Triumph parts and repairs, you are sure of expert advice. 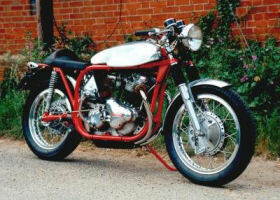 I have worked on many Triumphs and other Brits over the years and have several of my own. Somehow I seem to prefer buying them rather than selling !!! You know how it is! Where did the T8 in the name come from? Well, when we started we had trouble deciding on a name for our new business. However the stock was labelled T8 from the tender number on our purchase from Reverts and it just sort of stuck. Also makes a nice logo with a 8 stud 650 head gasket.